The administrator for Italy's ailing airline Alitalia has placed advertisements in four newspapers in a bid to lure buyers for the carrier. Administrator Augusto Fantozzi invited "whoever" might be able to guarantee the medium term continuity of Alitalia. Italian newspapers Corriere della Sera, il Sole-24 Ore and la Repubblica, as well as the UK's Financial Times carried the advertisements. 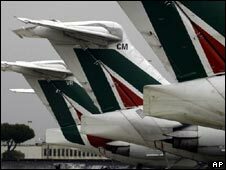 Alitalia is estimated to be losing more than 2m euros ($2.9m; £1.58m) daily. Any possible buyers have to express their interest in the airline by 30 September, but Mr Fantozzi is not hopeful. Speaking to reporters the administrator said: "There are no prospects for a rescue in reasonable time". On Monday the airline had placed the statement seeking buyers on its company website. The move comes after attempts to negotiate a deal with Italian consortium CAI collapsed last week, when six unions, who were unhappy at plans to cut 3,000 jobs, opposed the move. Three unions had backed the offer. On Monday Italy's civil aviation authority ENAC said it would withdraw Alitalia's operating licence this week if the firm failed to set out a cost-cutting plan. The country's debt-laden flag-carrier is currently flying with a provisional licence, according to ENAC's president Vito Riggio.